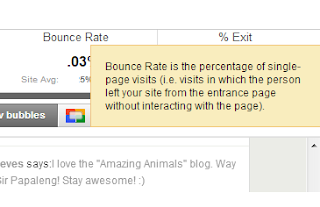 Bounce rate is the percentage of visitors that come to your page and don't stay for a longer period of time, the visitor leaves without visiting any other pages. 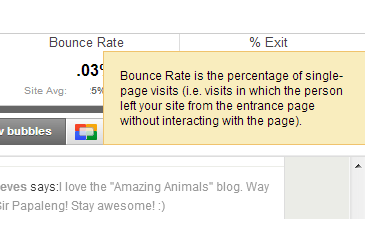 A bounce rate of more than 60% means a big portion of your traffic simply bounce back from your blog. It is frustrating to see that the hardwork and time you spent will all go to waste with the increasing bounce rate and even costly when you invested money hiring an SEO and paid ads to get visitors to your site. A high website bounce rate is a sign that the readers are not satisfied with your blog. Here are a few things you should do to reduce your blog bounce rate. You may think that some of the tips are not that important, but if you will apply all, you will have more regular visitors in the long run. Make your site lightweight and fast loading. Long loading time of your website will surely make the visitor go away to look for another site. To avoid this, make sure that your site is optimized for faster page loading, eliminate unnecessary flash elements and too much images. Pop ups can be very irritating and will just drive visitors away from your website. If you cannot avoid advertisements, try to minimize it,we don't want to see all the ads clutter all over the pages. Show your visitors what you can offer by having a transparent “About Us” page. This page helps the visitors or the potential customers to understand the services and product you offer. “About Us” page, will establish the identity of your brand that will eventually lower your website’s bounce rate. Related content attracts visitors. It wont hurt to have related links plugins in your blog. When visitors read your post and see another interesting link, they will keep reading your post until they are really satisfied with it. Linkwithin and nRelate are among the plugins common to websites. Bad template design will likely drive your visitors away no matter how good the content of your blog is. Check your template to see which parts needs improvement. Quality content is important for visitors to enjoy reading your post and stay there for a long time. Readers don't like to see a ton of spelling and grammatical errors. Re-read your blog post, and see whether you don’t break up big paragraphs in your content. Use “spell-checker” before publishing your post. 7. Check your post before publishing. There is the so called "Preview" to check for the appearance of your post. Visitors don't want to see irritating highlights, all caps lock and over sized photos on a blog post. Readability is important. Font size and Font color can drive your readers away. A font’s main purpose is to be read so get a a font that is easy to read. 12 point font is a minimum but still too small, try to use up to 16 point font, the bigger the font is, the easier to the eyes. Do not used gray or colored fonts, make sure to use black font on any background. It’s more inviting to your visitors to read content with bigger font. If you cannot make the changes on your own, it would be best to hire a professional web developer instead so that you do not mess up the entire website. I am glad to know this thing. 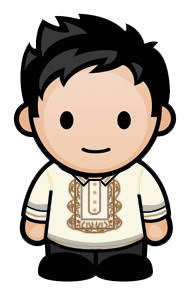 I am really a newbie about traffic and bounce rate. In y site I make sure that it loads fast.